We offer a variety of services for your home or business! 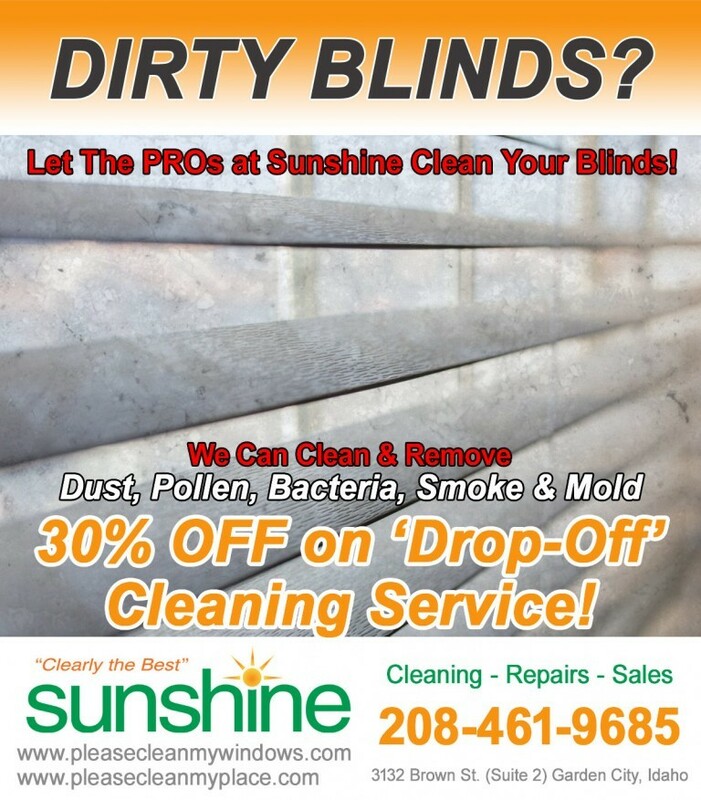 Sunshine Window Cleaning Inc. & Building Maintenance was established in 1993 in downtown Boise, Idaho, and has served thousands of residential and commercial customers. We are dedicated to providing high quality service by exceeding our clients' expectations. Welcome The Sunshine Into Your Home! Insurance is essential for your protection! We provide certificates of insurance evidencing proper workman's compensation and general liability coverage for all of our services. When hiring a window cleaning contractor, ask if they are a member of the IWCA. It's important because IWCA members have access to the latest equipment, techniques, and developments in the industry to help embellish and maintain the asset value of your property. We receive updates and support on the latest changes to federal regulations, which assures compliance and reduces the liability and risk to property owners. In addition to having access to the most comprehensive training program in the world, Sunshine Window Cleaning Inc. carries a $2 million liability policy so that you can choose our company with confidence. Every one of our professional technicians carries a minimum of $1 million in liability insurance. Sunshine has been serving Boise, the Treasure Valley, & the surrounding areas for over 20 years. The IWCA is the industry leader for training in the most advanced methods of residential and commercial window cleaning. We offer a Quality Service Guarantee. If you are not satisfied with our work for any reason, we will come back free of charge. 5 Stars! I just got home from vacation to find my windows sparkling clean! These babies were dirty too! They hadn’t been cleaned for a year or two; winter build-up, loads of baby finger prints on the inside, mold and WD-40 in the tracks . . . I couldn’t be more pleased. My windows looks beautiful! I plan to get them done once a year by Sunshine Window Cleaning! This is the best our windows have looked in years. I’m not sure if the price I mentioned above is exact; we had a Groupon coupon that cut the price considerably. But we were so impressed with their hard work and good attitude that we gave both of the young men a $20 tip. It was Christmastime, and they earned it. Sunshine Window Cleaning is hands down the best commercial/residential window cleaning service available for the most reasonable price. I highly recommend. I have been utilizing Sunshine Window Cleaning as an exclusive sub-contractor for over six years and have always received the utmost in quality and workmanship from Greg and his crew. I do not hesitate to recommend them for your service needs. Honest, Dependable & Competitive! I have had the pleasure of knowing Greg Reid of Sunshine Window Cleaning for over nine years. I worked for a property management company that depended greatly on him and his team. We hired them to do window cleaning service, and also many other tasks. Sunshine Window Cleaning was always promptly available for any job, big or small, that we asked them to do. Their bids were always competitive, and the work was impeccable. With great confidence, I recommend Sunshine Window Cleaning. We use Sunshine Window Cleaning for all of our clients’ window needs. At Freedom Maid, we only recommend the best and now our clients ask for them by name. Great job Guys!! Please let us know if you have any questions or if you would like to schedule a service!